Backcountry and Flats Fishing with Capt. Barry Meyer in Marathon Florida Keys for Bonefish, Tarpon, Permit, Redfish, Snook. These unique scenes can be custom made to fit your needs. The Bonefish, Permit and Redfish can be viewed from any angle. 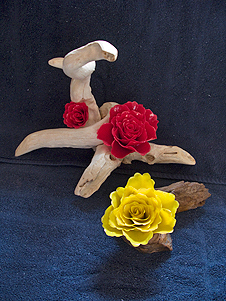 Trimmed in exotic hard woods these pieces will add beauty to any home or office. 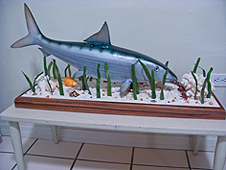 Made from real Tarpon Scales and mounted on locally found driftwoods, these pieces can be colored to your liking. Using the best epoxy resins, these pieces will last a life time and can be set on any shelf or table in your home. 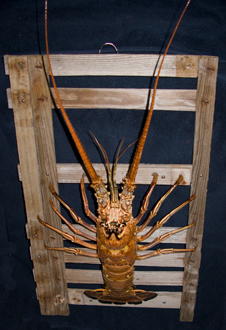 Diving and snorkeling for lobster can be a blast in the Florida Keys. If you catch a big one or just want a conversation piece to hang on your wall, I'll mount on for you. Generally set on a rustic trap lid and made easy to hang.